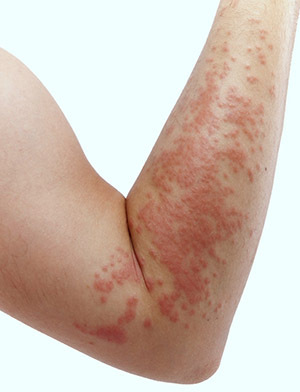 Hives or urticaria can be triggered by many substances or situations, and usually start as an itchy patch of skin that turns into swollen red welts. Hives can also “blanch” or turn white when pressed in the center. Triggers of hives include some foods, especially nuts, eggs and shellfish. Some hives will go away within a few minutes or hours, while others require treatment. Sometimes avoiding whatever gave you hives can help prevent them in the future. Depending on the cause of the hives, treatment can include medication. Get tested today if you are having symptoms for hives.